Alex Blake is a magician. He doesn’t work underwater with locked boxes or pull white rabbits out of his hat. 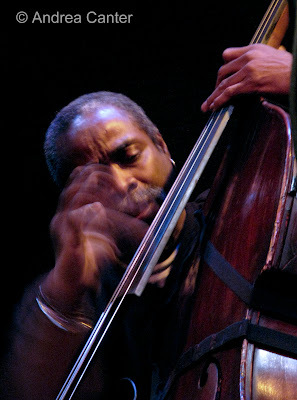 He performs astounding feats with the most unwieldy of instruments, the upright string bass. A long-standing member of piano legend Randy Weston’s African Rhythms trio, Blake, like most bassists, is the unsung hero of the ensemble, less familiar than the rightfully acclaimed leader, less of an obvious crowd pleaser than conguero (and magician in his own right) Neil Clarke. But his performance with the trio at the Dakota earlier this week was simply mesmerizing. To take your eyes off the bassist for more than a minute was to miss an Olympian gymnast twist on the still rings, turn on the parallel bars, catapult across the vault—all without leaving the ground, of course. But if his feet were anchored to the Dakota stage, Blake’s hands were somersaulting through thin air and earning perfect tens. All three of these musicians are percussionists. Weston has a fluid but assertive approach to the keyboard that conjures McCoy Tyner with softer shapes, and an improvisational sense that flits from Ahmad Jamal’s bare essentials to Abdullah Ibrahim’s elegance to Thelonious Monk’s quirky excitement. At 6’ 8”, he doesn’t so much sit at the piano as he surrounds it and holds it prisoner to his art. Neil Clarke is of course a percussionist, the man behind the congas who infuses power and joy with every swat of his hand, and who generates thunder and fury with such speed that you might miss the grace behind every move. But Blake, sitting center stage where the light barely illuminated the contours of his hands, commanded attention to the instrument that too often is ignored, or worse, disrespected as the backdrop, as the intermission between soloists. The bass was as much a drum as were Clarke’s congas. Within a given piece, Blake struck the strings in every way conceivable for bare hands, and perhaps in many ways inconceivable—flat on, full palm, strumming fingers, back of the hand, fingertips, lightly caressing, aggressively slapping. And that was just his right hand. Equally mystifying was the left hand as it moved like a slinky up and down the neck, providing its own percussive effects as well as producing sliding glissandos and popping staccatos. I’ve never heard such a range of sound from a bassist without once using the bow. The bow would have been superfluous—every sound as well as some new creations was present. I had the best seat in the house. Front row, on top of the stage, a clean sight line to Alex Blake. Be still my heart. That’s the sound of one bass scatting. Photo of Alex Blake at the Dakota on February 18th, waving the wand of the magic hand. Photo by Andrea Canter.